I am opening up about my anxiety a lot more as of recent. I have also noticed a lot of positivity within myself and often feel optimistic about the future. I am not entirely sure where this change has come from but I really like it. University for me has had its ups and downs. Each week varies and while one week can be spent with a lot of spontaneous fun, others can be spent curled up in bed with my anxiety on the rise. When I am sad, I often have no idea how I can shake the feeling off. Around a year or two ago, I'd seen a lot of things online about making 'Jars Of Happiness' for when life is getting you down. I'd always wanted to make my own but just never did. Until February, I had been having a whirlwind of a time in life and the weeks leading up to a specific date were truly wonderful. Long story short a freshly blossoming romance unexpectedly came to a halt and I was losing the love I'd had for my course. Three weeks of feeling sad and dragging myself out of bed for a course that felt more like a chore rather than something I really wanted to get a degree in had passed and I'd never felt so drained in my life, I decided it was time to pull myself together because it's no fun when you personally aren't having fun. One evening I was feeling very spontaneous, so set up a little arts station in the kitchen filled with coloured paper, scissors, a pen and a big mason jar (much to my housemates surprise). I knew it was time to shake off all the negative vibes I'd been feeling and that's where my beloved little Macy (Mason Jar) came into the picture. I decided I was going to add in notes of things that would cheer me up if I was having a bit of a rubbish day. It was difficult to begin with because I am in no way used to writing things I like about myself, or others like or even good things that have happened recently to me (too much of a pessimist) but once I got started, It felt really good. I also decided I wanted to have other people write little notes for me inside (those notes are all coloured and my own personal ones are just plain white). Some of my housemates have written me notes and I remember one day just needing my spirits lifted a little bit so opened up each note.. Even though it's a bit of writing on a piece of paper it actually makes me tear up reading the really nice stuff said about me by others AND the lovely things I say about myself. I am looking forward to adding and receiving more notes for Macy. It'll be awesome to look back in a years time to a hopefully well full jar. My number one goal for April is to continue to fill up Macy. It's so fun reflecting on all the positive things that are currently happening in your life to add into a jar full of all the other wonderful things. People have different methods of cheering themselves up and this just so happens to be one of mine. I think it's something really great to do and honestly has left me feeling a lot more positive than previous times. Do you have a Jar Of Happiness? 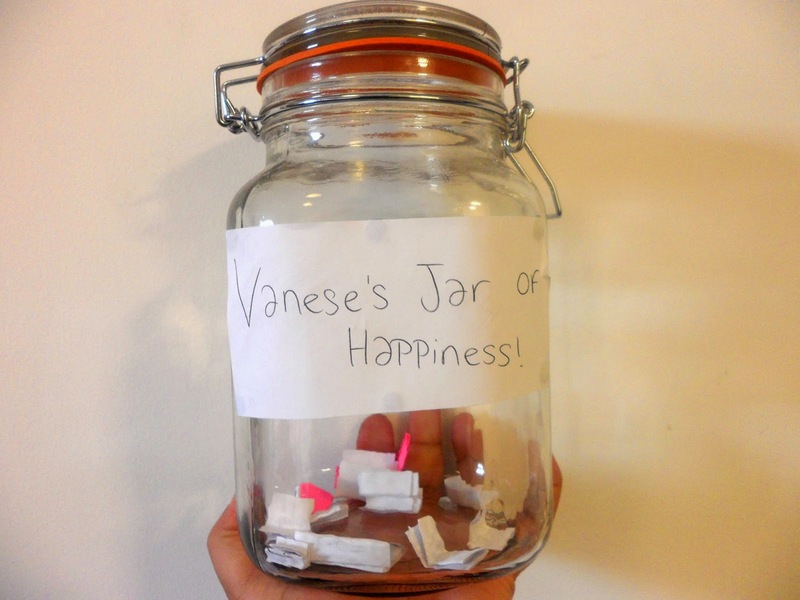 Jar of Happiness...What a beautiful idea! Putting ones ideas and thoughts out there does take some bravery, well done! Everyone has the occasional blip. But you've dealt with it really well, keep smiling! Thank you very much Zahra! :D that means so much! Thank you Holly :) I honestly couldn't recommend doing this enough. It really brings out the positivity in you. I think this is amazing and something I really think I need to do for myself too. I've gone through/still am going through similar struggles with romances and university. I'm pretty low right now, but determined to pull myself back together over easter :) Glad you are feeling better too! Wow, what a lovely idea! I always write myself positive notes on my ipod to cheer myself up. I now want a five minute gratitude journal - A Rosie Outlook did a wonderful post recently on hers! Check it out if you've never heard of them. It's the nicest thing to write down positive things to cheer yourself up! :) just read Rosies post on it, so totally going to create my own now. What an amazing idea. I did have one of these then I forgot to continue it :( I'll have to start again!